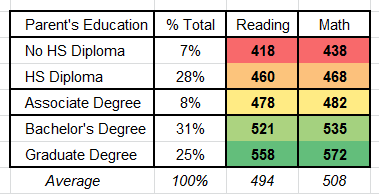 Score higher on the SATs … GUARANTEED! Just make sure that your parents went to college. Earlier this week we posted about how Asian-American students are being admitted to selective elite high schools at increasingly high rates. In part because Asian-American parents place a high priority on education, drive their children to excel (especially in STEM academics) and provide their kids with extensive extracurricular learning experiences. … and, I found traditional American values alive and well in the Heartland. 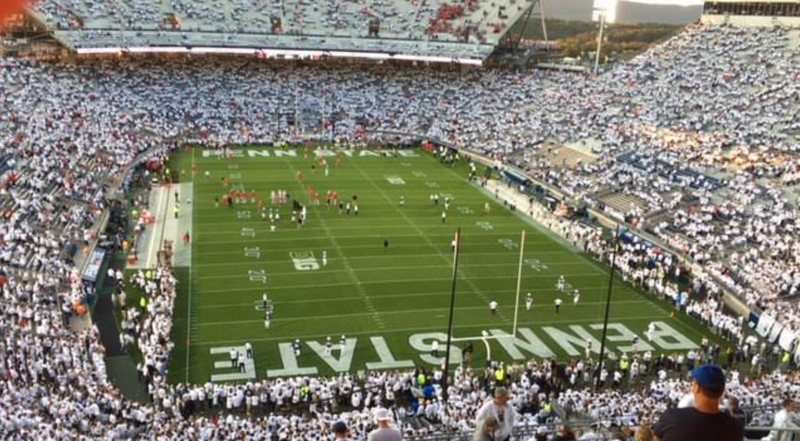 I temporarily broke my news cycle addiction by trekking to the Ohio State – Penn State football game in State College, PA (aka. “Happy Valley”). State College is in Pennsylvania farm country, secluded enough from the hustle & bustle of neighboring East Coast cities to legitimately claim its decades-old nickname. Recently, two of my grandkids — Maddie & Ryne — “graduated” from pre-school and are ready to start kindergarten in the fall. Both graduation ceremonies were awesome. I love the pomp & circumstances that elevate the importance of education. At Ryne’s ceremony, the parental crowd broke into applause when the kids presented their rendition of “Proud to Be An American”. Very appropriate to the July 4th run-up. If your battery needs charging, click the pic below to view a 15-second snippet. 1) While a dying breed, there are still families. 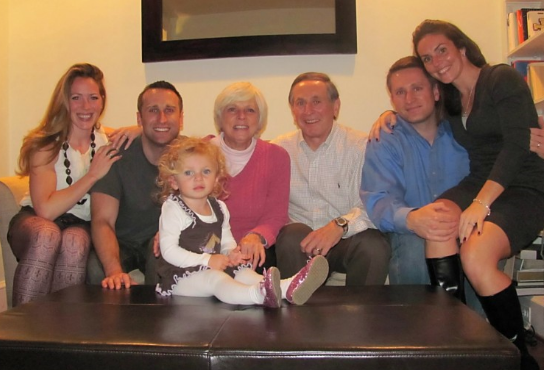 It’s fun being with your’s … and fun watching other families have fun … especially multi-generational families (<= grandparent bias). 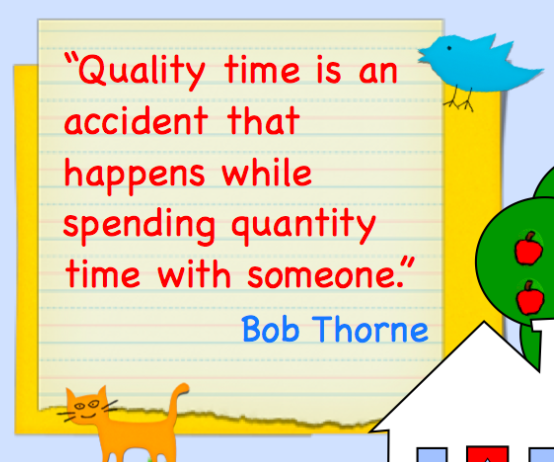 It’s not the quantity of family time, it’s the quality of it … dream on, mon amie. Back in my consulting days, I logged a lot of work hours. Par for the course. 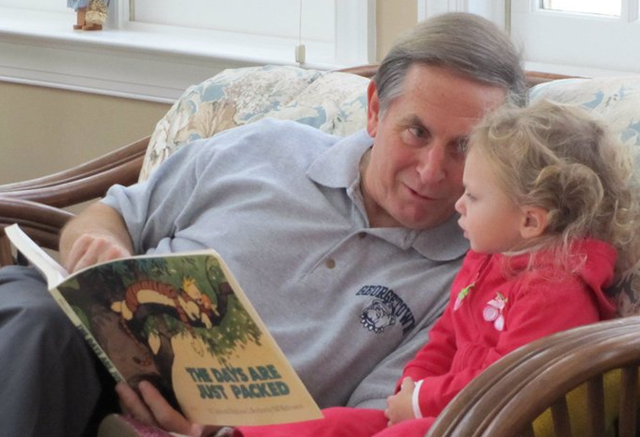 And, the prevailing wisdom was: “Not to worry about spouses and kids … it’s the quality of time spent, not the quantity”. I never bought in to the notion. 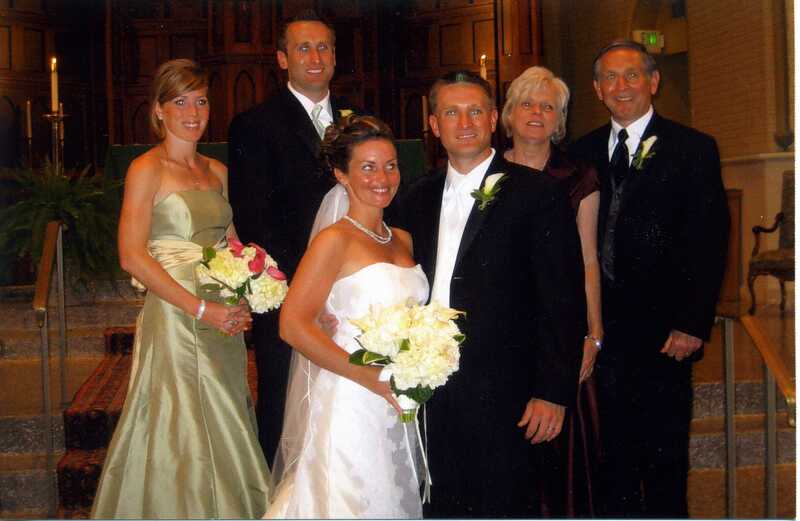 There were too many 2nd and 3rd marriages … and too many phoned-in happy birthday wishes to sons & daughters. I even remember the story of a son who was was asked to eulogize his father who was struck down early with a fatal heart attack. Eventually, I concluded that you have to throw a lot of quantity against the wall and hope that some of it sticks as quality time. You can’t just pick your shots and expect nothing-but-net every time. All of the above was brought to mind by a NY Times op-ed that struck a confirmatory chord …. Pew just published an interesting study on birth rates and family size. Here’s one of Pew’s spotlight charts. You’ve seen some of Bud Light’s commercials showing the strange superstitious stuff that people do to “help” their sports teams. You know, like sit in the same chair to watch games on TV … or eat the same food before every game … or turn their caps around for a rally. The tagline for the commercials is “It’s only weird if it doesn’t work”. If you don’t know what I’m talking about, watch this ad. Well, the Homa family has its own ritual when rooting for our favorites … the Monsters of the Midway … the Chicago Bears. We’re not talking Hobbit, we’re talking Pepper. We’re talking a real unexpected journey. First, some background for non-Georgetown folks. Theodore Roosevelt Island is a “living memorial” to America’s 26th president, a great outdoorsman and conservationist. The national park – located across the Potomac from Georgetown – has “miles of trails running through wooded uplands and swampy bottomlands”. 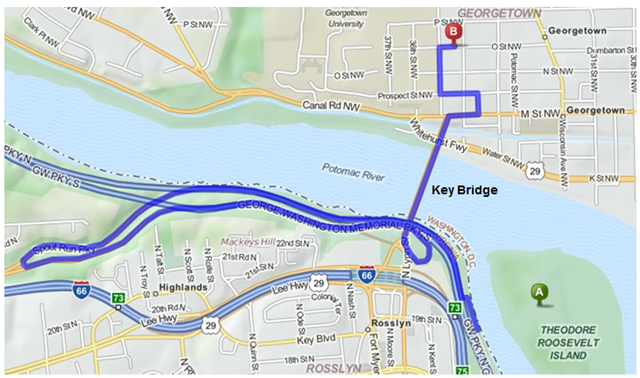 Mapquest says that it’s 3.61 miles from Roosevelt Island to the corner of 34th & O St.
Mapquest’s suggested route is depicted below – follow the windy road out of the park, head over the Key Bridge, turn right on M Street, then head up the side streets. It’s an easy trip by car, and a nice run on a Sunday morning. More specifically, it’s a nice run for a well-conditioned guy or gal. But, what about for a dog? The “Hot Dog” has always been a crowd pleaser among students who have survived my courses … some have ridden it hard, many have gotten tossed off (by a wild driver), others have cheered (and jeered) their friends, some have just heard tell of the good times. 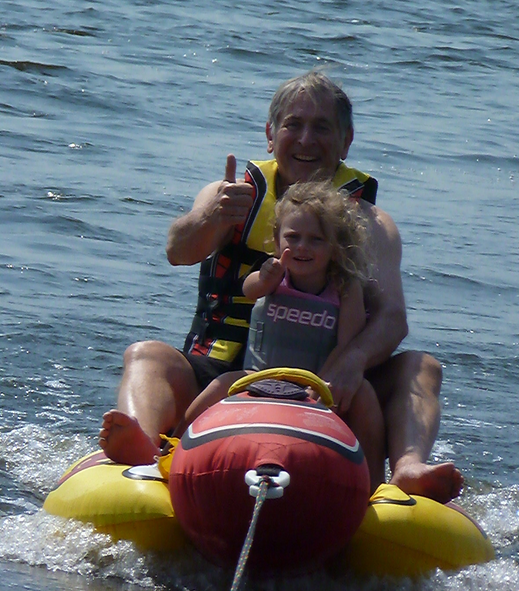 Well, I had a chance to take a couple of laps on the Hot Dog this summer … with my daring 3 year-old granddaughter Anna … in the picture, she’s signaling “go faster” … wonder where she got the competitive spirit? Fan of the game … and a Patriot, too ! 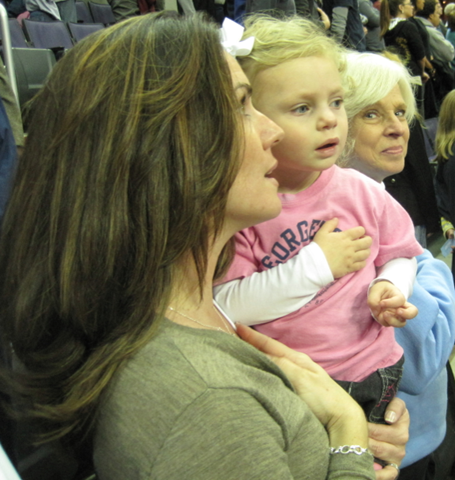 You guessed it: Granddaughter Anna … decked out in her Georgetown t-shirt … showing proper respect for the flag during the singing of the National Anthem … flanked by Mommie Meg and Gram Kathy … great time at the game … Hoyas won! Thanks to Meg (a.k.a. 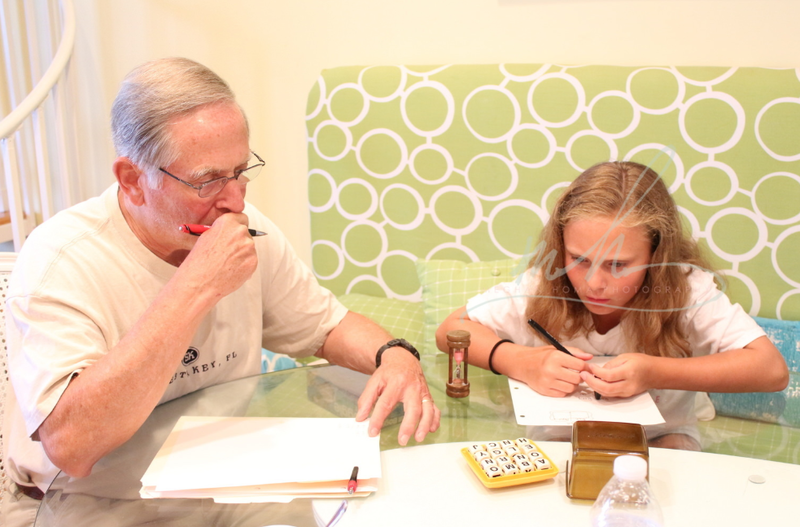 “Mommie”) for candid capturing this teaching moment. … from the Homa Family. Here’s the link to some pics from the 2009 Fall outing. Great weather, great food, great fun. Most folks know that I’m a big Chicago fan — the city, the Bears, the 1st place Cubbies and — oh yeah — the rock band. Gotta hand it to a band that stays relatively intact for over 40 years, adapts to the constantly changing music scene, can still pack an outdoor venue, and acts like they really want to be there. A woman and two dogs were paddle boating in the Magothy River this morning. One of the dogs – occasionally, but not dependably answering to the name “Captain” – nudged the other dog off the boat and into the crystal clear waters of the Magothy. The woman – identified as Kathy Homa was heard shouting, “Skipper, come”. But the overboarded dog – who is thought to be partially deaf – was dog paddling too hard to respond. 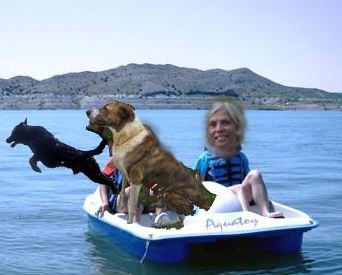 Mrs. Homa tried to hoist the big, black, water-logged mutt into the boat. Her fundamentally flawed plan was predictably unsuccessful. So, Mrs. Homa paddled like hell towards shore, hoping that Skipper would follow the boat (rather than heading off across the Magothy to Party Island). Skipper did follow the boat to shore and is back home, resting peacefully. Authorities praised Mrs. Homa’s quick reactions. No charges have been filed, but authorities said that they consider the circumstances to be “suspicious.” They did a DPS-like canvass of the area with negative results and still consider Captain to be a “dog of interest” in their continuing investigation. Arnold authorites recovered a surveillance photo that clearly shows Skipper voluntarily jumping from the boat. Captain has been cleared and is no longer considered a “dog of interest”.